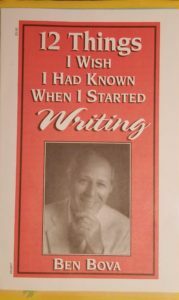 This entry was posted in publishing, the writing life and tagged Ben Bova by James Scott Bell. Bookmark the permalink. Once again, Jim, thanks for the advice. Since I am one of those “just starting out” I will throw out a topic I would love to hear discussed: Serialization or serial fiction. What are the pros and cons of using serialization to gain a larger readership? Print vs. digital? Legal considerations, contracts with print publications? Best digital platforms? Timing of publishing the book – before vs. after serial parts are completed? Advice on structuring the book to work best for serialization? And any other considerations that those of you who’ve “been around the block” might have. Thanks in advance for your comments? I was about to ask the same sort of question, Steve! I also want to know if the familiarity of a setting matters to the appeal of the book. If most people reside in cities, does that mean urban stories sell better than adventure stories that take place in Alaska? Steve’s initial question requires a full post (great question, Steve! If none of my fellow TKZ members want to tackle the subject, I’d be happy to share some series writing tips), but I may be able to help with your follow-up, Priscilla. Setting is important. Not, perhaps, in the way you think it is, though. To gain a readership who’s hungry for the next book in the series, create a setting that they’ll come to know and love. Your setting should almost be a character in and of itself. Whether it’s the city or a rural area like Alaska doesn’t matter, as long as you put the reader in that setting (tickling all five senses helps), and then remain true to your setting in future books. I have some fans who favor one of my series over another for this very reason; they relate to the country setting. Others like the other series better for an entirely different reason. We’d go crazy trying to please everyone. So, my advice is this: choose a setting that speaks to you, one that helps create the overall tone of the book, then give it all you’ve got to help the reader to visualize it. Just be careful not to use too much description, or it can work against you. Instead, sprinkle tidbits here and there. Jordan Dane used Alaska in one of her books, and I absolutely loved it. She lived there for several years, so the setting really came alive. It also worked for the plot. The title of her book escapes me at the moment. Perhaps she’ll chime in. I lived in Anchorage, AK from ’81 to ’91 & loved every minute of it. I also traveled the state above the Arctic Circle (with my energy job) & did remote fly-in fishing trips for fun. I prefer the cold over heat. It was an adventure of a lifetime & I’ve written about it a great deal. It takes planning a broad landscape to build a world with compelling characters to entice readers to follow your story line. I recommend taking time to develop story arcs over each novel as well as over the whole series. Are the stakes elevated enough to keep readers’ interest from book to book? Does your series have an end (like Hunger Games) or are you planning to write a series of standalones that build on the journeys of your characters (like Robert Crais’s Elvis Cole PI series)? These days if you write/self-pub a series & make book one free, readers tend to prefer a well-established series of more than one book. They may wait until you have the full series written or have enough stories to get them hooked. So you may want to wait until you can release more than one book. If you get traditionally published, your house generally squeezes your book into their production schedule with months between, even if you have books written. Or if your house releases your books back to back, will they optimize your promo to build excitement for your whole series or will your 2nd & 3rd book fall short due to timing of release being too soon? But if your serialized fiction doesn’t gain traction, you can invest a great deal of time in writing books & promoting them that may not have a payoff. How do you know when to quit? Do you end your series to give your readership a satisfying resolution or just stop writing it? When you self-pub, you have more control over this, but a traditional publisher may pull the plug & not allow you to determine an ending until you get your copyrights back. Bottom line is – do your research on what the market is for your series (read & analyze popular series & take notes on what works with plot structure & characterization) & write a well-crafted series. Will this series build on a voice (& genre) that you want readers to discover in you? I’ve seen series/serials written with huge cliffhangers at the end of each book that make readers feel cheated, especially if they have to wait for the next book. Endings for books & series installments can be tricky. I prefer subtle endings that hint of a mystery to solve for the character(s) in the next book. But I recommend resisting cliffhangers where your character is literally hanging by their fingernails about to drop to their death. The hint of a well-crafted mystery (that’s substantial enough to intrigue the reader) can be more effective without letting the reader down. In any series I’ve written, I plant seeds for a future book in case I want to explore another novel, even if my book was written as a standalone. In THE ARMS OF STONE ANGELS (my debut YA), I planted seeds for my teen girl being unsure where she may have gotten her paranormal abilities. A subplot was woven into the tale about a mysterious father who may have passed on his gifts to her, a father she’s never known. I hope this long reply helps, Steve. Thanks for your advice. Very helpful. I realize now that I was not clear enough with my question. I meant serialization in the form of parts of a book being published (print or digital) separately and over time – like Charles Dickens and books in the early 19th century – as a means for a new writer to find more readers. I understood what you meant & have found common ground between writing avseries as well as serialized content. I’ve written for RADISH.com and used novels I’ve self-pubbed or received my copyrights back to create serialized formats. There are other sites like Radish that cater to the same readership who buy stories in increments. Sites like this can build your readership & in the case of Radish, you can expose your work to a younger readership who like reading off their phones or showcase your work to readers in a different area of the world (such as Asian countries) who already enjoy reading serialized content off a smaller screen. My thoughts on series vs serialized have common application. In my novels, I like adding page turning chapter endings, which works for serialized stories. Another thing you can consider, Steve, is to hook the reader, then ground her in the setting (five senses) at the beginning of every major scene and always use a cliffhanger at the end (though the cliffhanger might be physical, psychological, emotional, etc.). In my own writing, each major scene is also a chapter. They typically run 900 to 1200 words, which is also a good length for serialization. And if you encounter a platform that requires 2000 or 3000 words bites, you can send more than one scene/chapter at a time. First, write the dang book. Make it the best book it can be. THEN start worrying about these questions. Amen, sister. It all starts with a great book. FIELD OF REAMS – Write it & they’ll come. The eye-opener for me was “Only trouble is interesting.” I spent too much time following my characters around doing dull stuff. The hardest words to write for me? “By Friday, they had …” But wait! What happened on Tuesday, Wednesday, and Thursday? And something I heard agent Kristin Nelson say that relates to “[Start] your story in the midst of brisk, exciting action.” She said she saw too many manuscripts where the author had interpreted that to mean “Open with a battle scene.” If the readers don’t know something about the main character, they don’t know who they should root for. When I was starting out, I thought there was something wrong with me because I couldn’t write a scene about characters enjoying themselves. I hear what you’re saying, AZ. I write scenes that push the plot by 1-3 points with a purpose. But it is fun to realize that character growth & insight can mean a lot to readers. Maybe a carefully woven fun subplot can work. In one of my recent stories, I wrote a subplot of my hero searching for the right service dog for a young woman assault victim. Readers really responded to it. Who doesn’t love puppies? Plus I could share what I’d researched on service dogs in a fun personalized way. It added to a touching romance I was developing that continued through my series. My readers wanted to see more between my hero & his love interest from book 1. “Murder your darlings.” My early books had too many lectures that I’d been itching to deliver. They slowed down the plot. It takes discipline to avoid these. It’s amazing how you always sync your topics to my immediate needs. I love your Middle Moment chapter. I write the main twist and then the MM. So, check and check, the middle is covered. But wait— not so fast. Now you, Ben, and Terry O. show me the misunderstanding that made me put the middle in the wrong place. I see that my murder can no longer be the big middle surprise. It has to be the engine. Moving it to the beginning will up the pace and support the premise—but require me to create a whole new twist and MM. Writing is such a hard, hard addiction. A wonderful post, JSB. I’ve only been writing 4 years, have 1 finished (but unpublished) western novel, lots of short stories, and a current western WIP. I wish I had read your book on conflict and suspense 4 years ago. I’m just finishing it now and in truth my copy is so full of highlights and underlines it looks like a final exam notebook. It has significantly influenced my approach to my WIP. Thank you. Structure is the magic bullet of storytelling. I wish I’d studied scene, sequel, overall story structure, and MRUs a lot sooner. Awesome post, Jim. Safe travels! 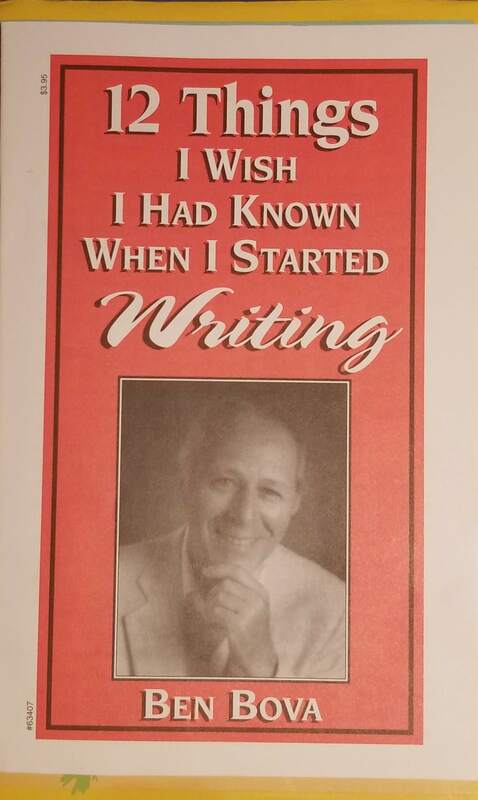 Ben Bova’s book on writing, its title changes with every new edition, is worth its weight in gold even if you don’t write science fiction. It was the first book where plot actually made sense to me. NOTE: Not every book or article on writing works for every writer. Any author who says his process is the only process isn’t paying attention. He also isn’t a writing teacher. What Bova means by character and problem is that character and plot are the same. He believes that the writer must examine her character and find his one glaring weakness and attack it through plot. This conflict should exist on many levels. In other words, the character’s emotional struggle should be mirrored in the action of the novel. In the first STAR WARS, for example, Han Solo’s cynical selfishness wars with his unselfish love for idealistic Luke. Han’s ready to leave with his loot when the Alliance attacks the Death Star, but risks everything to save Luke. That emotional conflict is mirrored in the struggle between the two political factions as well as in the thematic two sides of the movie–the good and dark sides of the Force. Thanks for this. I’m always looking for valid new writer resources to pass along. I just wished I knew that there were writing books and blogs out there five years ago. It would’ve made my learning experience a lot faster. The big epiphany for me–and I think I said this here before–was structure. I always thought I was terrible at plot, but no, I just didn’t know how to pile stakes on top of each other, and when and where. Something I’d love to learn is how to craft a compelling ending. I don’t know if it’s possible to talk about that, everyone I’ve asked never gives an answer, but I’ll just put it out there. How do you raise the stakes fast enough but not too fast without inserting new information after the beginning of the third act. One of the “tricks” I like to do is create a beginning that can seem to come full circle at the end. You put your characters through living hell, but give the reader a sense that they’ve come full circle with the characters (even if the world is different because they survived & learned something that changed them). Sometimes a final scene between the main characters can be quiet yet tug at the heart in a meaningful way. I love sustaining a mystery on a character’s motivation & carry it through to a touching & emotional ending. That’s when I write a big reveal on why the character has behaved the way he/she has. A quiet but meaningful ending like this can be an emotional treat for the reader. I love getting emails from readers saying how much they cried. Leaving the reader with an ending scene that punches them with emotion can inspire them to click on more books from me. In TKZ archives, alumni Joe Moore wrote a post on endings. If I can find a link, I’ll post it. Thanks for your question, AZ. Here’s the Joe Moore TKZ posts on writing endings. Be sure to read the comments where our TKZ community makes their contributions to the discussion. And I did. I also shared it on the Writers Resources page of my website. 2. To trust my subconscious and allow my characters to tell the story (since they’re the ones who are living it). Once I learned those two things, everything else was gravy. Fabulous advice, Jimbo! I would add that we often focus so much on our beginning that we forget to spend some time thinking about the ending and what will leave the reader eager to read the next book. For too many books, I tended to rush the ending and it took time and experience to figure out how to give readers the emotion at the end they needed.